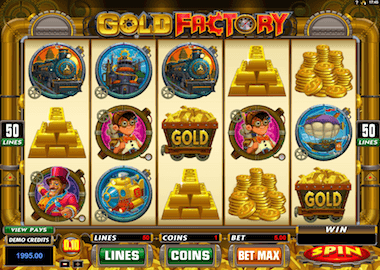 The Gold Factory Slot is a five reels slot with three rows and 50 paylines. The slot is from Microgaming and is one of the older online slots. For this reason, the game is also available only conditionally on smart phones or tablets. The minimum bet on the Gold Factory Slot is 50p and you can spin reels up to a maximum of £100. There are several bonus rounds: the Gold Factory Bonus triggers a Free Spins feature, the Ball Room Bonus or the Reactor Bonus. The top price is 61.900 coins. Symbols and Payouts: The symbols of the Gold Factory are all topic related. There is a whole set of scatter symbols and also a wild symbol. Normal symbols include goldmunzen, gold bars, gold wagon, an airship, a submarine and a locomotive. Last mentioned symbol is the most valuable symbol and pays up to 800x your bet. There are three scatter symbols: the man, the boy and the gold factory. These symbols pay up to 2.500x your bet. Top symbol is the wild symbol and this pays up to 7.500x your bet. Gold Factory Bonus: The Gold Factory Bonus feature is your gateway to multiple bonus rounds. You will need 3, 4 or 5 of the golden Scatter coins to start the Gold Factory. You then play the Boiler Room Bonus, Reactor Bonus or Free Spins Bonus. Boiler Room Bonus: The Boiler Room Bonus feature is a Pick and Win feature. You can choose 4 out of 12 items, which include hidden prices. You can also activate another feature from here if you find the Free Spins symbol or reactor bonus symbol. Reactor Bonus feature: The Reaktor Bonus is also a Pick and win feature, but this time you’re in a different Reactor chamber. There are again 12 items which you can choose. Avoid the two malfunction icons, because they end the feature. You can reveal a total of 10 items with a price. Free Spins feature: The Free Spins feature triggers you when you uncover a Free Spins icon in the Boiler Room. You then start the Free Spins feature, which can not be extended. The feature is pretty basic: you play with the same bets and payouts as in the base game. The Gold Factory Slot is a pretty good game if you manage to start the Gold Factory bonus game. Everytime you can play another feature and the winnings are pretty good. You are welcome to try the slot here for free, just click on the banner above. More Microgaming slots are available here. UK Casino with Microgaming slots are very common. Recommended is the Grand Ivy Casino, LVbet Casino or the Casino Joy. You will receive bonuses and free spins after your registration.